The dream of free municipal WiFi refuses to die. Meraki Networks is picking up the ball that Google and Earthlink dropped, expanding its free WiFi network to cover all of San Francisco. The service will be ad-supported (ads appear in your toolbar when you are browsing through a Meraki WiFi router), and the build-out will be paid for out of a $20 million series B round the startup just raised from Sequoia Capital, DAG Ventures, Northgate Capital and other existing investors. This round is on top of $5 million Meraki raised last February from Sequoia and (ironically) Google and former Google employees. Meanwhile, Google’s once-vaunted WiFi initiatives have dwindled down to providing free WiFi only in Mountain View, CA (where Google is headquartered). And Google’s biggest WiFi champion, Chris Sacca, is now gone. Google’s WiFi effort in San Francisco is all but dead, mostly because its partner, Earthlink, decided to get out of the municipal WiFi business. So why does Meraki (and its new investors) think it can succeed where Google failed? Well, for one thing, it is already providing free WiFi to 40,000 people across two square miles of San Francisco. (With about 500 WiFi repeaters supporting them). It is simply expanding that program (to about 10,000 or 15,000 repeaters). Second, free municipal WiFi is not Meraki’s only business model (more on that below). 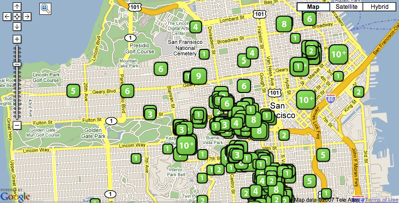 It is using San Francisco basically as a giant demo for other cities. But, third and most important, its mesh technology is a cheaper way to blanket a city in wireless broadband than through standalone WiFi hotspots. Meraki’s WiFi routers connect to each other through a mesh network, meaning that many can share a single broadband connection. They are cheap, can be placed outdoors on rooftops and balconies, and can even be solar-powered. The company expects that it will only cost a few million dollars to cover all of San Francisco, compared to the $14 to $17 million estimated for the Earthlink/Google plan. “There is a pretty drastic cost advantage,” says CEO Sanjit Biswas. “Our network will come in at the low, single-digit millions,” he predicts. Meraki will even offer residents free repeaters to amplify the WiFi signal inside their homes, and shoulder the entire cost itself rather than ask for public funds. All the routers will also be on private property, not public property, and thus avoid the politics of involving the city government. He is not being glib. Meraki’s real business opportunity is overseas with telecom companies in emerging countries like India and Brazil, who desperately want a cheap way to spread broadband and charge for it. Meraki makes a little bit of margin on its hardware (routers go from $49 to $199 each), but the real money is in managing large networks in partnership with telecom companies, where Meraki takes a 20 percent cut of the access fees they charge. The free WiFi in San Francisco might help build some buzz, but it is not going to spread anywhere else—unless those local ads start bringing in some real cash.